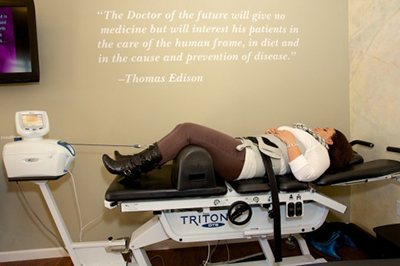 Spinal decompression is an effective, non-surgical way to alleviate back and neck pain. During the process of spinal decompression, pressure is applied to decompress your spine, intervertebral discs and joints and your spinal muscles are stretched. Spinal decompression relieves pain as your spine receives oxygen, blood and nutrients that promote the body’s natural healing process. You will often experience some form of relief during your treatment, but it is important to remember that your treatment plan should be followed through to the end to allow for maximum healing and long-lasting pain relief.